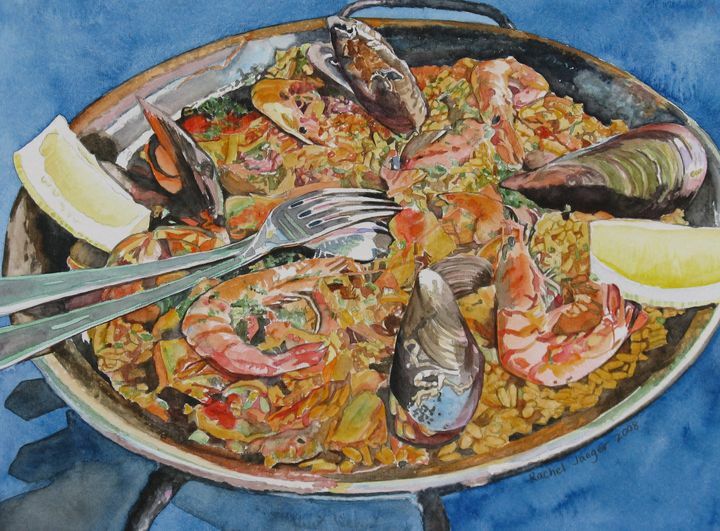 vibrant watercolor of a pan of paella in Sevilla Spain. The palette of this piece is a vibrant true blue ground, with bold golds and a variety of colors and reflection. Highly detailed fork and spoon embedded in a pan of cooked saffron rice with shellfish and lemon wedges nestled into it. After graduating with her BFA from California State University in 1995, Rachel went on to pursue a wide range of life experiences and occupations, all over the world. Some of those include teaching first, third and fourth grades, moving to Spain as an au pair, enlisting as an active duty soldier in the United States Army, and extensive and unusual travel. With camera frequently in hand, she captures a variety of moments, moods, people, and places. Referencing her photographs and experiences, her heart’s calling is to showcase the beauty of life. Her paintings are photo realistic, vividly colorful, and include subtle details which bring life and a documentary element to her work. Feb 2017 Purchase Award- State of Wyoming public buildings. Nov 2015 Governors Choice Award- Governors Capitol Art Exhibition, Wyoming State Museum. Oct 2014 1st place- National Creative Arts Competition. Durham, NC. Oct 2013 1st place- National Veterans Creative Arts Competition, Reno, NV. July 2013 Juror's Award- Orange County Fair Fine Arts Competition. 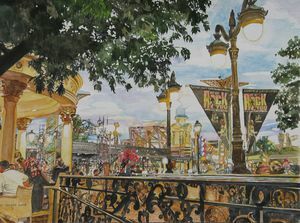 June 2013 1st place in watercolor and 1st place Art Supply Warehouse sponsored Special Award- Garden Walk Anaheim Art Association 50th Annual open juried Art Competition. Her greatest gifts are her salvation through the Lord Jesus Christ, her husband Jason, and their four beautiful daughters whom she home schools. 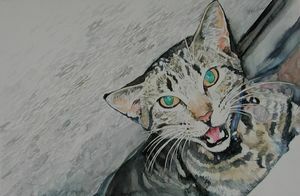 She paints from their home and studio in Cheyenne, Wyoming.